Love fiercely and steadily, foster curiosity, value adventure, and above all, cultivate kindness. The backcountry is a sacred classroom for our family--- it’s where we feel invigorated, at peace, challenged, and are able to grow and bond in a significant way. I believe in nurturing with nature. This post is sponsored by Marmot and Shopstyle. Shopping for outdoor clothing always takes a lot of comparison and research. I love cruising the ShopStyle website to compare similar products from different brands to find exactly what I need. I was particularly excited to try the Featherless line from Marmot as I’ve been curious to try some high performance synthetic insulated outerwear. Marmot claims that their Featherless line is as warm as 700 fill down- and I’m happy to report that it is true! It all looks pretty, doesn’t it? The baby bundled in her bunting, the toddler throwing a snowball, the fat flakes falling among the tall evergreens. Well, I have to be honest with you: hiking in a snowstorm with children is… more work. Snow was swirling upwards from the parking lot towards the tree tops when we pulled up to the trailhead. The thermometer in my car read 18 degrees, but I was guessing it felt colder with the wind. The baby was happy sleeping in the car, and Huck just woke up from his nap and was protesting. The Istari Jacket from Marmot has an awesome 70’s style. I’ve been wearing this jacket everywhere. “Ugh. Why do we do this to ourselves?”, I ask my husband. After a few minutes of dragging our feet, we start bundling everybody up in our winter layers, and finally feel brave enough to open the car doors. Look, getting outside in the winter doesn’t have to be painful. Successful winter adventure is ALL ABOUT THE LAYERS. 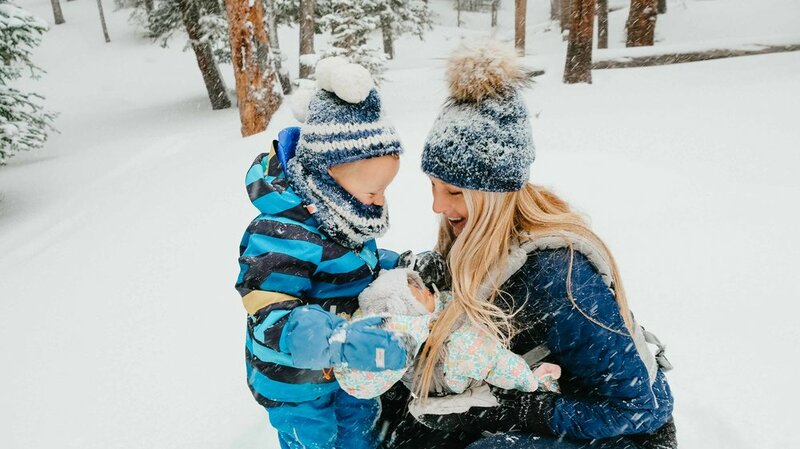 With the right layering system, exploring the trails as a family in the winter can be an absolute pleasure. When Marmot asked me to team up to find a “Better Way to Warm”, I was excited to find some solutions to the challenge of staying warm on the trail. 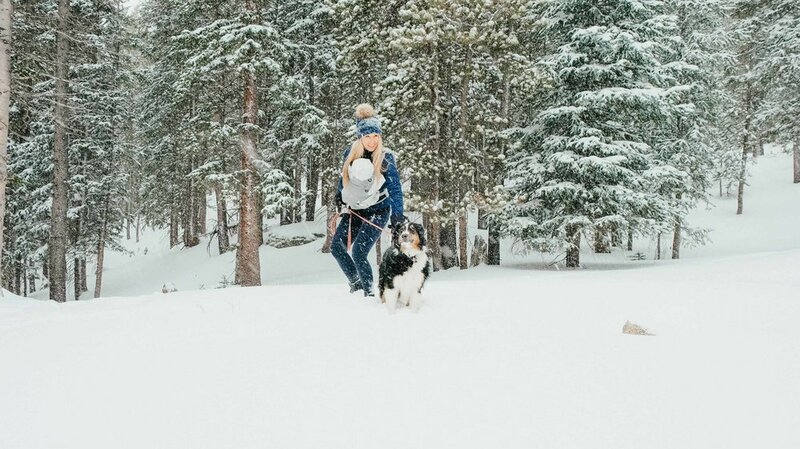 As I’m getting dressed to head out to adventure in the snow, I like to start with a synthetic or wool base layer to help wick sweat and keep me warm and dry. Over my base layer, I use an insulating jacket to add warmth. The Istari jacket from Marmot stands up to the warmest insulating jackets I’ve used, and is sleek, and fitted, and has become my new go-to jacket. Over my insulating jacket, I’ll often add a waterproof gore-tex layer to keep everything dry. I use this same layering system for my children, adding additional layers as needed. *Typically I’d throw a waterproof layer on over by insulating layer, but I wanted to test out to see how well the featherless insulation (made from 3M Thinsulate Recycled Featherless Insulation) would keep me warm if the jacket got wet. Happy to report: I stayed warm! 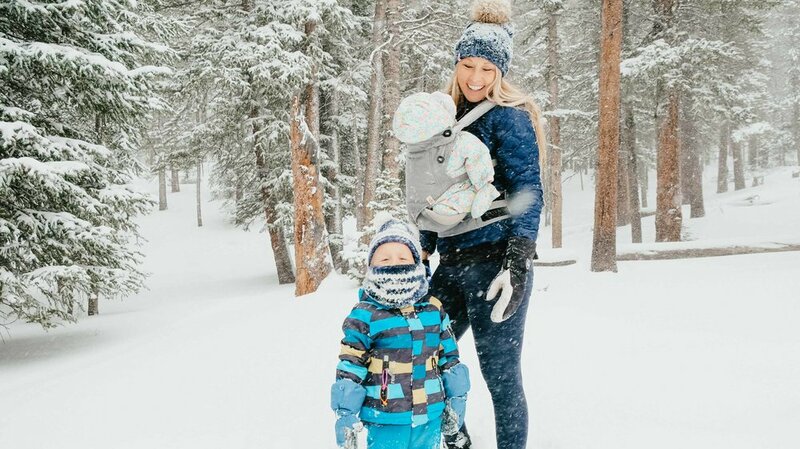 Before my first winter hike with Huck (when he was just a few days old), I talked to his pediatrician to get some advice about winter adventure. She told me that the most important factors were to make sure air passages stay clear, that the baby is dressed in 1-2 extra layers than you are (as they aren’t exerting energy for extra warmth), that you can check in on the baby frequently, and that their delicate skin is protected from wind and sun. I have a more in-depth post coming out about this soon! In the past, I only used down insulation. However, whenever I’d head out in wet conditions, there was a part of me that was always worried about how warm I’d stay if my insulating layer got wet. When I saw that Marmot had a synthetic insulated jacket that claimed to be warmer than 700 fill down, I was curious to give it a try. I’m always looking for a better way to stay warm. There are many factors to consider when choosing synthetic or down insulated outerwear. I’ve always heard that synthetic insulated outerwear/sleeping bags continue to insulate when wet. Synthetic insulation also dries much more quickly- which is a major plus. These were some key selling factors to why I wanted to give this jacket a try. Another perk? This sustainable jacket is made from 75% recycled materials! I’m happy to report that during our hike we encountered some conditions that let me test how well the featherless insulation worked. It was snowing, windy, and the temps were in the teens. Although my hair was soaked by the end of our hike, my body felt dry and warm. As soon as we start hiking, the synapses in my brain begin firing as the cold air enters my nostrils. Huck stops complaining and starts begging to get out of the pack to roll in the snow and make a snow angel. I look down at Tatum in the baby carrier, and see that she is warm and sleeping. We only hiked and played in the snow for about 45 minutes before we called it a day and headed down to the brewery for dinner. Sure, it took a little more work to get outside in the snow, but we were all giddy and silly after playing in a snow globe.